There are so many reasons to start your garden from seed! You'll love the exciting variety of available seeds, and you'll save money and enjoy greater control over the health of your plants. Barbara Ellis, an expert gardener and author of several books on gardening, offers practice, concise advice for sowing seeds, managing seedlings indoors and out, and developing schedules that ensure your seedlings are ready to plant when the weather is right. 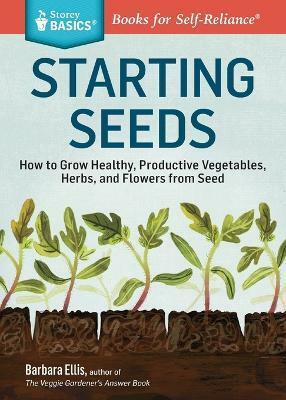 Starting Seeds offers everything you need to begin a thriving garden. --Charlotte Observer A great how-to resource for self-reliance. --Tulsa Book Review Starting Seeds is a basic guide to growing plants from seed, whether they're started indoors or out. --Portland Book Review Starting Seeds is a basic guide to growing plants from seed, whether they're started indoors or out. --Portland Book Review A step-by-step guide with simple but descriptive drawings, Starting Seeds should help the gardener from the moment the seed envelope is ripped open to setting out the young plants. A fantastic resource for starting plants from seeds. Starting Seeds walks you through everything you need to start in the endeavor of starting plants from seed in your front room, basement, greenhouse, cold frame, or kitchen window. Barbara W. Ellis is a freelance writer, editor, and lifelong gardener. She is the author of many gardening books, including The Veggie Gardener's Answer Book, Deckscaping, Shady Retreats, and Covering Ground. She holds a B.S. in horticulture from the Ohio State University, Columbus, and a B.A. from Kenyon College. She has worked as managing editor at Rodale Press and as publications director for the American Horticultural Society and is affiliated with the Hardy Plant Society Mid-Atlantic Group, the Garden Writers Association, and the Perennial Plant Association. She lives and gardens in Maryland, where she and her husband live in a renovated "green" home with an assortment of rescued dogs, cats, and parrots. Her garden, which is managed organically and designed to be wildlife-friendly, features a wide range of ornamentals, herbs, and edibles for both sun and shade.